Here are TWO new recipes that we tried this week. Both were tasty, and fit most of the criteria listed above. Not “oh my goodness” amazing, but definitely better than fast food take out. I did not take pictures of either because the pics on the recipe links are much better than I could produce. This recipe uses flank steak. I purchased the tenderized flank steak from HEB and it worked well. Ben gave this “two thumbs up” – Nick was not happy that he did not make it back to the wok before Ben picked up his second helping. No leftovers. This is a keeper. Especially easy if you have a rice cooker – I could not without mine! I still own my original rice cooker – the first appliance purchased for my first apartment when I got my first teaching job 27 years ago. Pretty amazing! * I have found several good recipes on this website. This was a very simple recipe – right at 30 minutes. I especially appreciated that all of the cooking took place in one pan. One pan and one cutting board did the trick. You can control the salt in this recipe by using the Low Sodium Chicken Broth. HEB has a deal right now – by a carton of broth, get a free serving of Chicken Noodle Soup. I purchased thinly slice boneless pork chops – very reasonably priced and provided the perfect “meat” experience. All of the veggies (except the scallions) are added at the end, so picky eaters can choose what they wish to add to the dish. *Unfortunately I have not gotten feedback from either of the boys on this one. My guess is that it would be favorable. What recipe is next on my list? Where do you go to find new recipes for those weeknight meals? 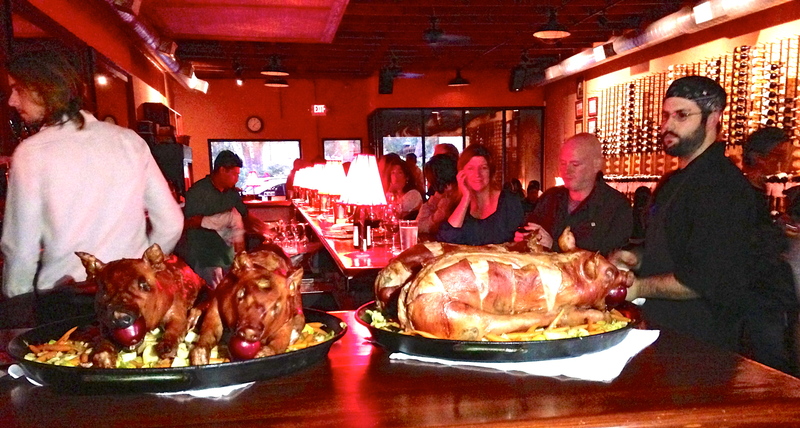 On the occasion of their 6th Anniversary, Vino Vino roasted not one, not two…but four pigs for a festive evening of culinary delight last Monday. We arrived and were immediately handed glasses of bubbles which set off the festive atmosphere. It truly was a fun room! And it was a Monday. Paula Rester and the “rest-of” her crew know how to throw a party! We were one of the first to sit at a reserved table. And soon after we did, the other tables filled up quickly, each waiting with breathless anticipation of the entrance of the pigs. We knew a grand entrance, or a “meet-your-meat” event, would happen. The way they present their Paella on Sunday nights begins the same way: enter early, sip something, and applaud as the HUGE Paella dishes enter the room, coating the air with an aroma of Spain, so good your tongue begins to lisp as if you’re overwhelmed to speak Castilian Spanish Spontaneously…(say that three times with a lisp). Michael recommended two wines to pair with the pig- A German White or a Beaujolais. 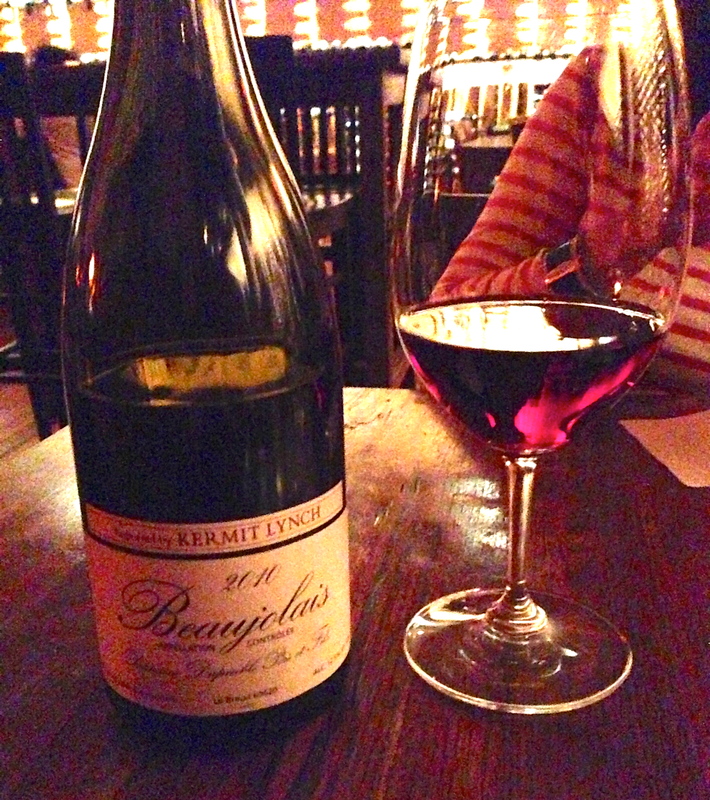 We were in a red mood, so the Kermit Lynch imported 2010 Beaujolais it was. EXCELLENT paring. Wine Tip– Paula tells us anything Kermit Lynch imports is great. Notice the extra label he adds. Wonderful variety of meat from different parts of the pork. Juicy, tender, melt in your mouth! 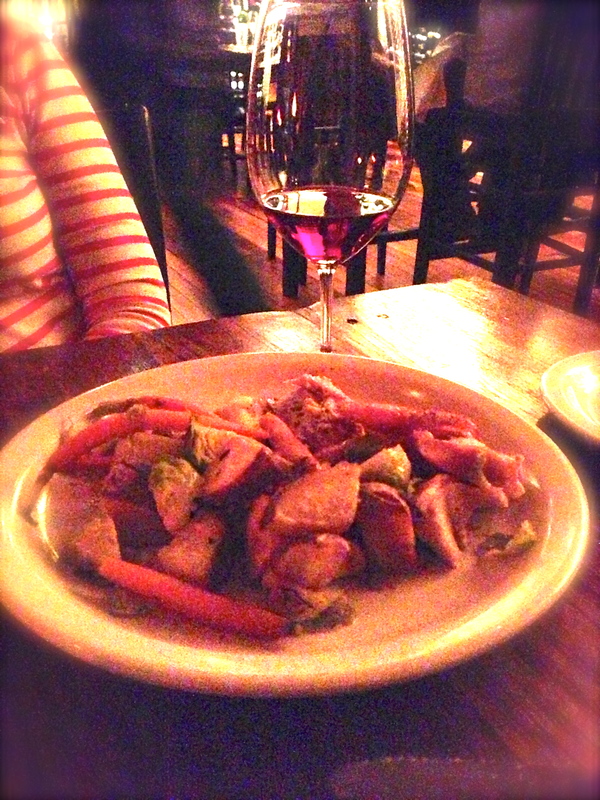 The “a jus” is beautifully seasoned served with carrots, brussels sprouts, and roasted potatoes. Each of these vegetables soaked up the “a jus” and gave it their own take on flavoring this dish which brought out a full spectrum of flavor unimagined for a plate of pig. The potatoes helped keep the saltiness in check, the brussels sprouts were fresh and surprisingly my favorite (and I usually don’t choose brussels sprouts). Surprising observation- if you presented this dish without the “meet-your-meat” event, we would have thought you were serving turkey…good turkey, even smoked turkey (my favorite). Flavor, juicy…..I’m drooling again…. 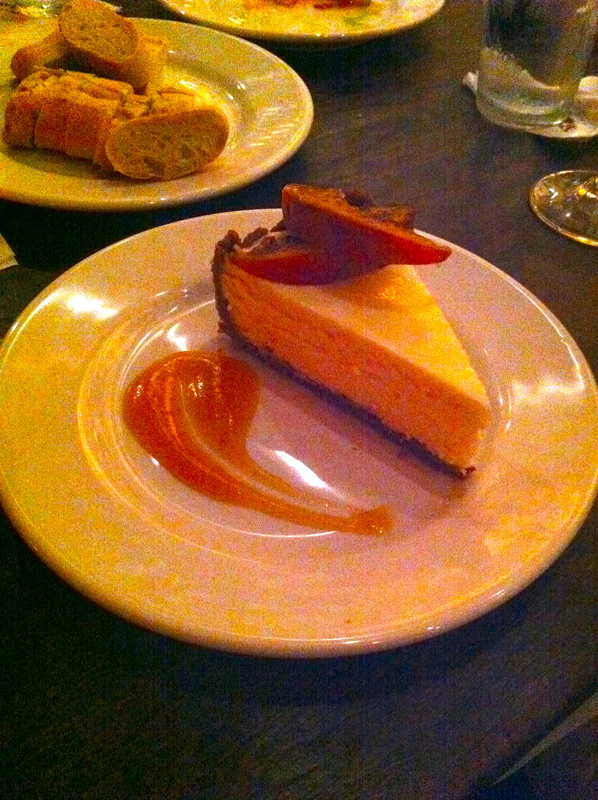 And of course, we can’t resist the goat cheesecake….BEST CHEESECAKE IN TOWN. The Butternut Squash. We have been receiving a lot of this lately, but in small quantities. I read that they keep for a good while, so I waited until I had enough to make a good batch of soup. After reading through lots of recipes, I decided to create my own recipe using several of the ideas I found during my research. First, I knew that I did not want to mess with peeling the squash, so I cut them in half, cleaned out the seeds, rubbed them with some butter, seasoned them with salt and pepper, then turned them upside down in a glass baking dish and cooked them at 400F for about an hour. ( Oh my, that was quite the run-on sentence.) Take cooked squash out of the oven and cool. While the squash is cooking, chop up some onion (I had ½ of an onion in the fridge, so that is what I used). You could also add garlic. I forgot this time around. Saute in olive oil until soft and transparent. At this point, add your flavors. I had fresh sage, so I chopped up a tablespoon or so and added that. Next, I added fresh thyme – it is so much fun to run your fingers down the branches to release the cute, little leaves! I also had a small chunk of ginger, so I peeled that and grated it into the onions. When the onions have cooked for 10-15 minutes, scoop the cooled squash out of the skin and add to the onion mixture. Next comes the adding of liquid. I thought I had chicken broth on hand – wrong. Therefore, I used what was available in my fridge – about ¾ cup of beef broth and some apple juice. I added only a ½ cup or so of juice at first. Now to create the perfect texture. I wanted my soup to be finely pureed, but not runny. I tossed it all in a blender and pureed. It was still pretty thick at this time. Then I put it back in the pot. Now I could add apple juice until I reached the desired texture. I was pretty pleased with the outcome. This lovely Butternut Squash soup definitely deserved to be plated in our china soup bowls (which don’t get used enough). I added a small scoop of mascarpone cheese and a sprinkle of roasted pumpkin seeds. I forgot to mention that I fried a few sage leaves in the hot olive oil prior to adding the chopped onions. Marc would probably agree that although the “Add-ons” made the dish prettier, and added a surprise of texture from spoonful to spoonful, they certainly were not necessary. The soup definitely was the star, rich, creamy (with NO addition of any milk product) and full of flavor. This will probably be on the menu the next time we host friends for dinner. Who’s coming over? local food has fewer “food miles,” is handled by fewer people and is miles fresher — you can taste and feel the difference! But wait – there is another great benefit from getting produce delivered to your door. Letting someone else “select” your bushel of produce challenges you to try new foods. This can require some research, and of, course, new recipes. Right up my alley! Two new recipes made it to our table recently. 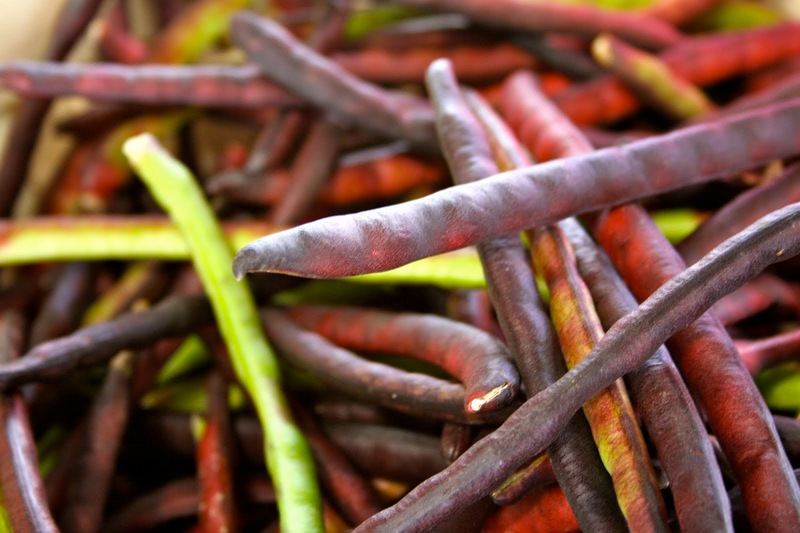 The first was inspired by fresh Purple Hulled Peas. This is what they look like pre-shelled. They arrived already shelled, so they were really not purple at all. 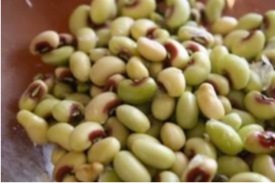 Similar to black-eyed peas, both are in the cowpea family. Therefore, I decided to prepare them just like the fresh black-eyed peas we received a few weeks earlier. * Cook some chopped bacon in a pot. Add diced onion and minced garlic and sauté in the bacon fat. Add the beans and some chicken stock. Cook for about an hour or so. That’s it. 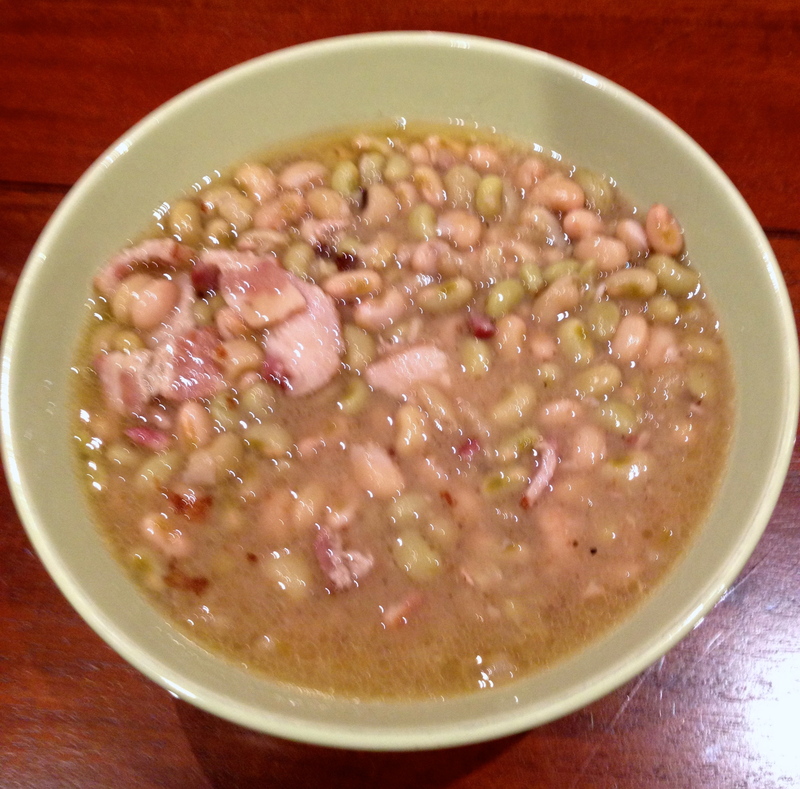 If you wanted to make more of a meal out of it, you could add ham and rice (more like Hoppin’ John – lots of recipes online for this Southern classic). My apologies for the less than stellar photo. 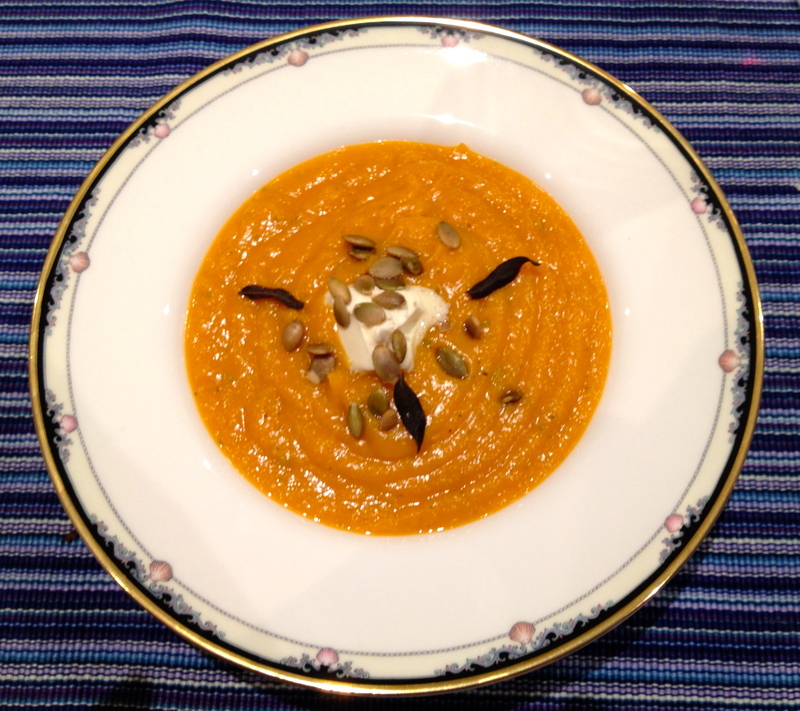 Part 2 – Butternut Squash.